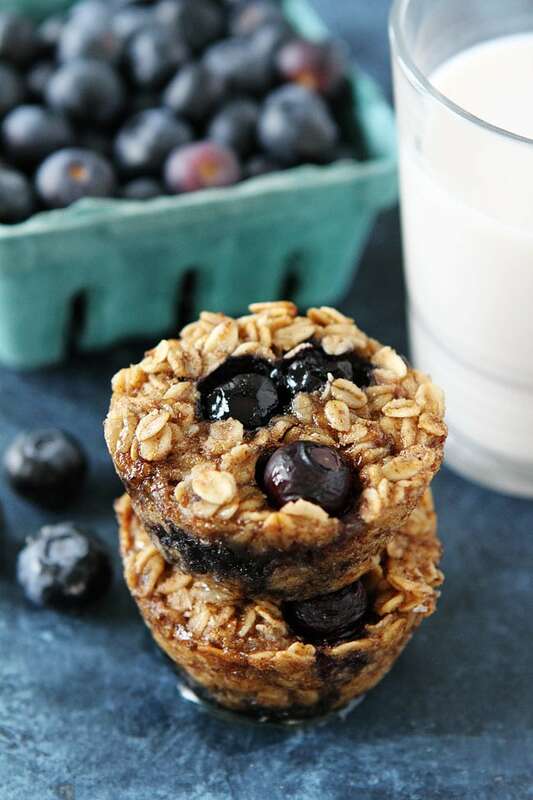 Banana Blueberry Baked Oatmeal Cups-these easy baked banana blueberry oatmeal cups are vegan and gluten-free! 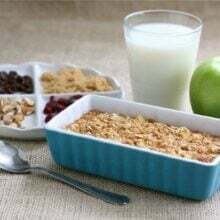 They are perfect for breakfast on the go, school lunches, or snack time! 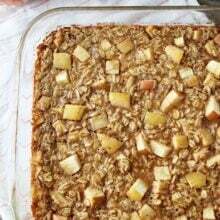 We are big baked oatmeal fans and I love making a big pan, but sometimes it is fun to switch things up. 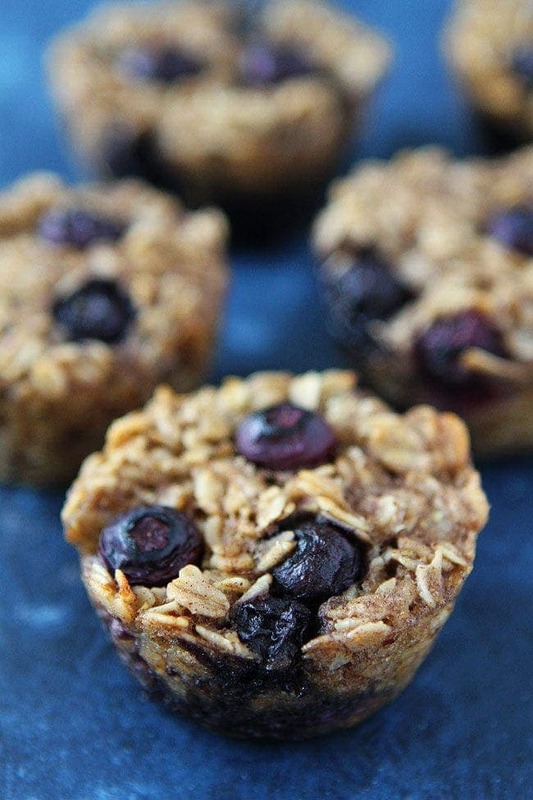 These baked oatmeal cups are easy to make and fun to eat! They are made with oats, Almond Breeze Almondmilk Unsweetened Vanilla, pure maple syrup, coconut oil, bananas, and blueberries. I always have these ingredients on hand so I can whip these baked oatmeal muffins up all the time and anytime. I like to use Almond Breeze shelf stable AlmondMilk because I always have it in the pantry. 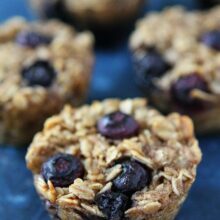 The unsweetened vanilla is my favorite and is perfect in these oatmeal cups! I love the individual portion sizes. They are super cute and make the perfect grab and go breakfast. I keep a batch in our freezer at all times so I can pop them in the microwave for 30 seconds for an easy and healthy breakfast. The oatmeal cups also make a great snack. You can pack them in lunch boxes, take them on road trips, plane trips, hikes, or picnics! They are an all day, good for you snack! I took a few muffins on my trip to Sacramento a few weeks ago and they were the perfect plane pick me up! So what did I do in Sacramento? 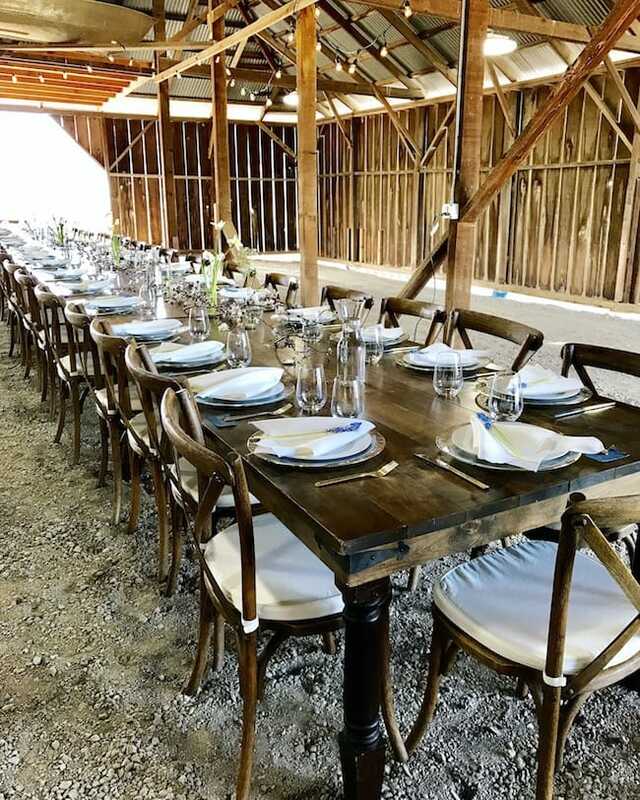 I toured an almond orchard with Almond Breeze. 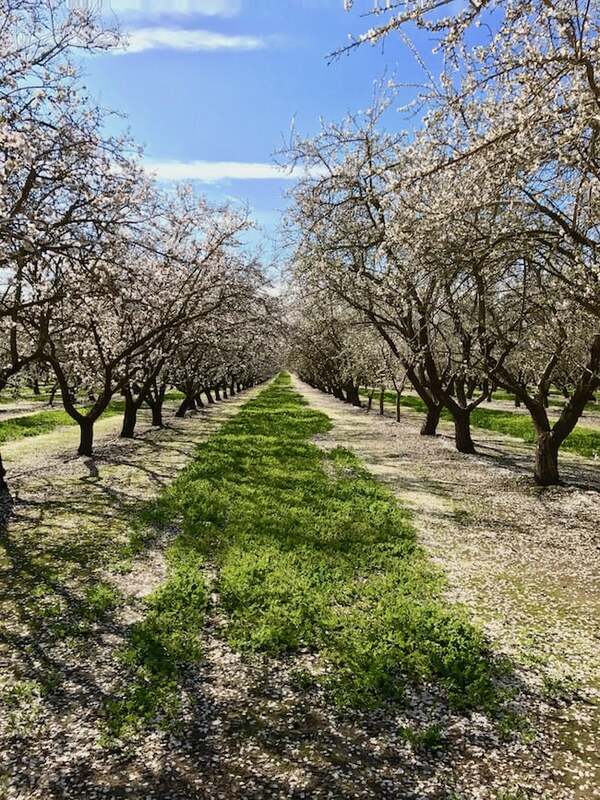 We have worked with Blue Diamond Almond Breeze for years, so I was super excited to see the almond orchards up close and personal. Plus, I got to hangout with some of my favorite blogging friends: Well Plated, Simply Quinoa, FoodieCrush, Ambitious Kitchen, and Love & Lemons. I know some of you saw my adventures on Instagram, but I wanted to share a few photos today. 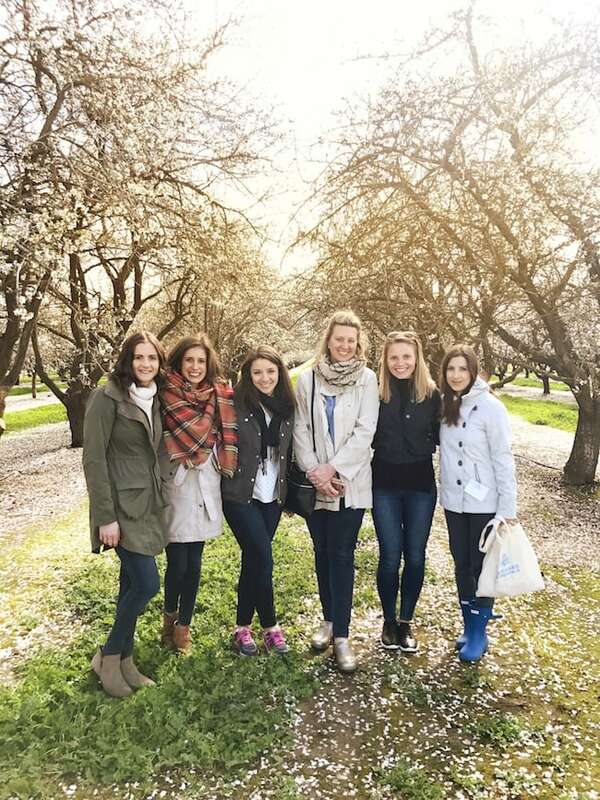 We visited a family farm that was covered with beautiful almond trees. The trees were in full bloom and we lucked out with a beautiful, sunshine day. We walked through the orchard and learned all about almond growing. To be honest, I didn’t know almond trees were so beautiful. Now, I love almonds even more:) The grower we visited is a third generation almond grower and is very passionate about almonds and his orchard. California produces over 80% of the worlds almonds and Blue Diamond ships almonds and almond ingredients to over 90 countries. It was such a fun trip! Thanks Almond Breeze! 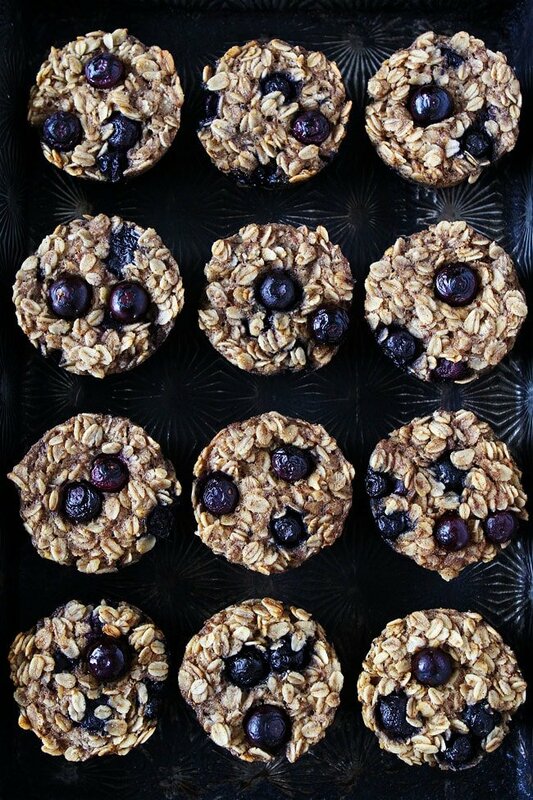 Make sure you try my easy Banana Blueberry Baked Oatmeal Cups. They are a breakfast favorite at our house and I think you will love them too! 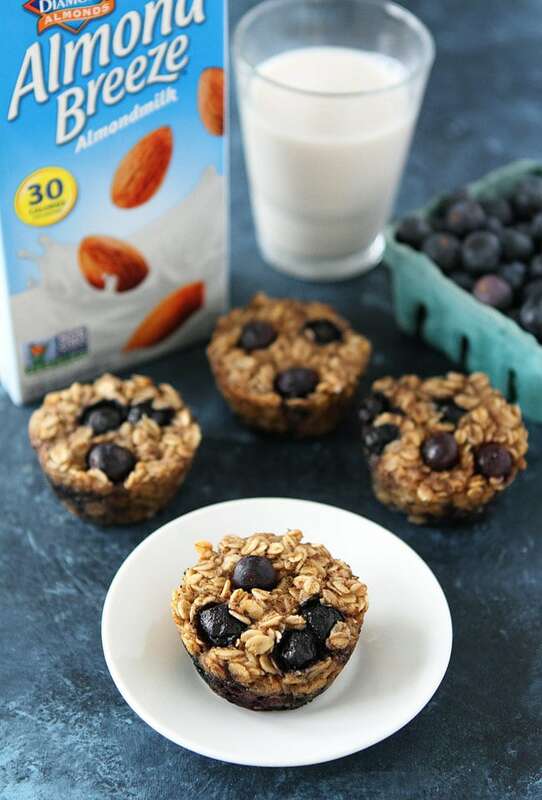 These easy baked banana blueberry oatmeal cups make a great breakfast on the go! You can store them in the fridge or freezer, reheat and eat! Preheat the oven to 350°F. Grease a muffin pan with nonstick cooking spray and set aside. In a small bowl, combine the ground flaxseed and water. Let sit while you prepare the other ingredients. 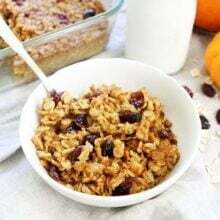 In a large bowl, combine the oats, baking powder, salt, and cinnamon. Set aside. In a medium bowl, combine the mashed banana, flaxseed mixture, melted coconut oil, almond milk, maple syrup, and vanilla extract. Add the wet ingredients to the dry ingredients and mix to combine. Gently stir in the blueberries. Pour the mixture into the prepared muffin pan, filling each cup evenly. Bake for 23-25 minutes or until the cups are a golden brown. Remove from the oven and let the muffins cool in the pan for 5 minutes. Remove from the pan and serve warm. Note-if you don't need the recipe to be vegan you can use one egg instead of the flaxseed and water mixture. The oatmeal cups will keep in the refrigerator for 2-3 days in an airtight container or in the freezer for up to 1 month. Reheat in the microwave. I love banana and blueberries so this is a must recipe for me to make! Thanks for sharing, Deano. The trip looks like it was so much fun! And what a gorgeous orchard. Of course the muffin cups – I need a dozen. So you have the nutritional details (calories,fat etc) thanks! I don’t know the nutritional information, sorry! You can always plug it into an online calculator. What a fun trip and I love these cute little grab and go cups! These look great. I sure hope they turn out better than the recipe I tried similar to this, this morning. Will try these tonight so DH can have them to go for his trip tomorrow. I have to say thank you for your great recipes. I have tried a few of them now and have yet to be disappointed. Yay! I hope you like these two. They are a favorite in our house! This recipe sounds yum! We regularly keep unsweetened almond milk in the house, but not vanilla. If I use the unsweetened almond milk, would you just bump up the vanilla extract? Yes, you can use the unsweetened original. You can add a little more vanilla! Enjoy! Do you think substituting cut up strawberries would work? Yes, I think strawberries would be good too. They have more moisture than blueberries so they might be a little more moist, but still good! I just did strawberries and they were definitely moist. They needed longer to bake, next time I would probably not do strawberries again. Yum Yum! I use the unsweetened vanilla Blue Diamond almond milk too..isn’t it great! It is the best! Glad you like it too! I do not like bananas. What could be a substitute for the recipe?? I have only tried it with bananas. If you don’t use banana, you will probably need a little more milk. Is it possible to use regular whole milk instead of almond milk? I would love to make these! So much fun! I wish I were there and sharing these oatmeal cups with you! 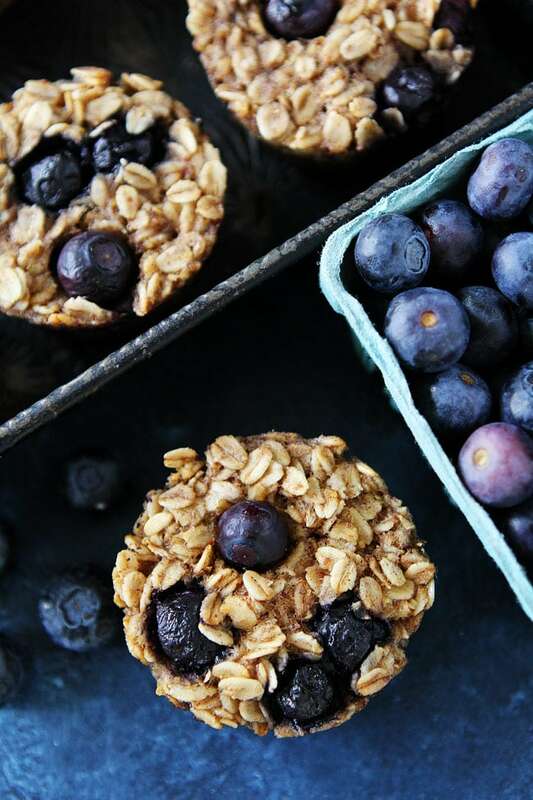 Love the sound of these blueberry oatmeal cups! hey girl- these look so yummy! Love the pics of the orchard! So pretty! Hi, Thanks for the recipe. I made them this morning but not sure about the texture. Are they supposed to have a moist texture? I cooked them for 30 minutes. They were golden brown and tasty but don’t if they were supposed to be dry and more cake like. I have not tasted baked oatmeal. My concern is to get the right texture. They held up well and I could pick them up to eat. The inside was like a cross between bread pudding and oatmeal. I wonder if the blueberries released too much liquid? I want to make these tomorrow, but don’t have any flaxseed. I know that it is used as an egg substitute. Would it be possible to use an egg in this recipe instead or would it affect the results? I’m so sorry, please ignore my comment. I just read the note! Any idea what the calorie count is on each one? They look delicious and great for a run out the door breakfast. 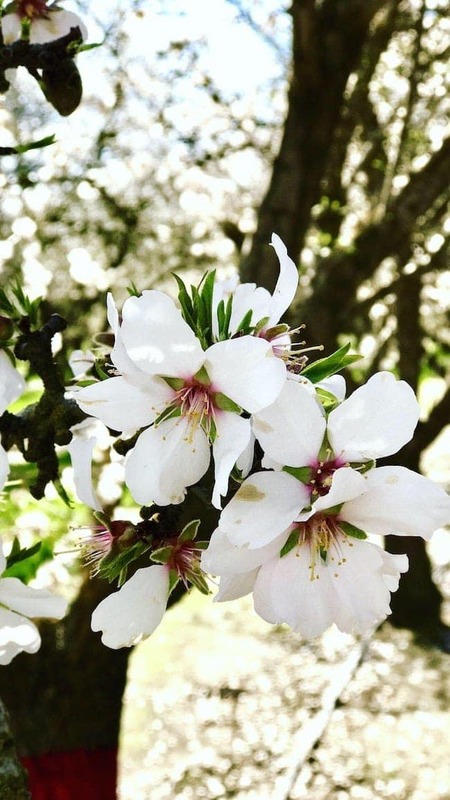 I love the pictures of the almond trees, they are beautiful and it is the first time I have ever seen them in bloom. These look scrumptious! Since i have everything but the ground flaxseeds, could i replace the ground flaxseeds with Egg Whites? I just saw the answer! Sorry. I really enjoy your posts! Thanks so much! This is good to know! A reader left a comment saying there are 74 calories in each oatmeal cup, but I didn’t calculate the information. 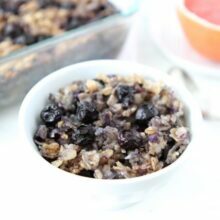 Is it possible to use quick rolled oats instead of old fashioned? I haven’t tried quick oats. The texture might be a little different. Let me know if you try it! What are the nutritional values for this recipe?? A reader commented that there are 74 calories in each muffin, but I haven’t personally calculated the info. Can you use butter instead of coconut oil? I am sure melted butter would be good too! My mixture was totally different to the one in the video – really runny….help, what did i do wrong?! Also, in addition to my earlier question, is it possible to use butter instead of coconut oil? My family is not vegan and we don’t typically have these things on hand. Sure, you can use butter. Enjoy! Wonder if I can make in a regular pan because I only have one small muffin pan. Might have to run to store later and buy a muffin pan. These are delicious! Thank you so much for the recipe. I am curious– how many calories do you think are in each cup? THANKS!! Hi! I made these a couple of weeks ago and even though I greased the muffin tin, I had a hard time getting them out of the pan without them breaking up. I did th flaxseed/water mixture instead of the egg, but since I don’t need it he recipe to be vegan, I can use an egg. Do you think it would bind them better than the flaxseed and help to keep them together? Any other tips? Maybe bake a bit longer? Maybe try baking them a little longer so they are set? I haven’t had a problem with using flax, but you can use an egg if you don’t need them to be vegan. These are delicious. I had to use an egg instead of the flax meal, and they turned out perfect. They’re hearty, with just the right amount of sweetness. How many calories are approx in each oatmeal cup? Do you have nutritional values of your recipes? These are fabulous! I literally can’t keep them in the house…had to make a quadruple batch in order to freeze some! These were really great! One suggestion though: Make sure the almond milk is at room temperature or the coconut oil will harden on contact. Other than that , these are wonderful! I found it too oily and not sweet enough (used coconut sugar and coconut oil). I also find cooking with coconut oil frustrating. I will try applesauce next time instead of oil and maybe increase sugar a bit. Otherwise they are tasty. Love it! I added some vanilla protein powder and it tastes amazing. Love the on hand Ingredienrs and the simplicity of it!! Thank your for a healthy recipe. What can I use instead of coconut oil? This is my go to recipe. I love making and freezing these for my toddler son (and myself!). Pretty healthy with berries, flaxseeds, and oatmeal but ridiculously tasty. Thank you so much for making this recipe. Its the only one of its kind that’ll do. Yes ,it tastes good for me. Now I’ll c if the little kids like them??? It’s definitely a great way to eat some oats everyday. Thanks.